Our conservation team and volunteers are going all out this year to help clean the reefs, beaches, mangroves and ultimately, the ocean. Working side by side with two international environmental organizations, namely The Ocean Conservancy and Project AWARE - Dive Against Debris, our staff and volunteers now have an even deeper purpose behind the weekly coastal and marine clean ups. All the volunteers involved in the global ‘clean up’ network not only pick up trash, they record every item they find on standardized data record cards. These organizations then analyze the data and compile reports on their findings. In fact, The Ocean Conservancy publishes the world’s only item by item, location by location snapshot of marine debris in an annual report. They realize that by understanding what is out there, the world of volunteers can work together on solutions. From data collected over the years, they recorded that, each year volunteers collect more than a million beverage bottles from beaches, shorelines, and underwater in just one day. Incredible! Dive Against Debris, was started this year by Project AWARE and is the first International initiative designed to collect debris and data on every dive, with the aim of helping to change global waste management policies. We know that despite the large amount of beaches, mangrove forests and reefs we clean, these clean-ups alone are not going to solve the marine debris problem. However, in order to hit the source, we can provide these organizations with the most data available, which they in turn will take to the policy making officials, so that better informed decisions can be made. Our data also enables community leaders to plan and develop their existing waste management and recycling programs. Also, when such large worldwide surveys are conducted and the data collated, the facts and figures are so shocking, that individual members of society are inspired to properly and conscientiously dispose of trash and keep it out of the ocean. 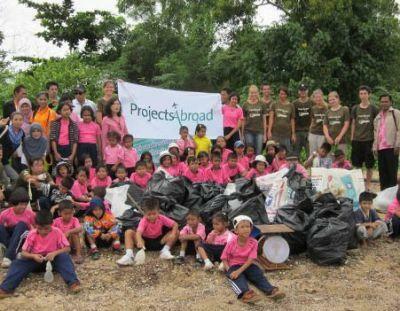 A big thanks to all the Conservation Volunteers who have helped in Thailand this summer!